Start your QTrader demo today! CQG™ offers one of the most extensive and reliable data and market analysis tools in the industry. For over 30 years, professional traders have relied on CQG's™ accurate, uninterrupted, high-quality data. CQG™ provides a large variety of customizable charting techniques and formulas to fit the needs of any trader. CQG Simple- Offers the same features of all the CQG family of products including quote board, DOM trader and position monitoring. The biggest difference is that the DOM trader only displays the current bid and offer of a product. CQG Trader- This is the standard CQG trading platform that most everyone is familiar with. 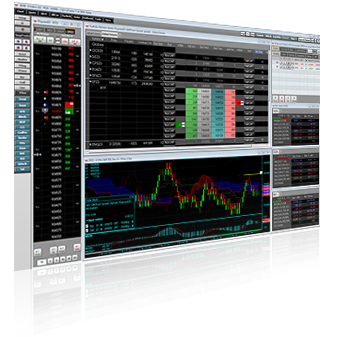 Once installed, this product Includes the traditional quote board, DOM trader and position monitoring. QTrader- Qtrader provides standard graphing and charting capabilities with the traditional CQG-Trader platform. CQG Integrated-This is the full expanded version that CQG offers. This will include higher level graphing and charting functionality plus enhanced order entry capabilities which includes Autospreader. Alert Trader - automatically places orders when price, time or condition alerts are met. Fungibility - supports contract fungibility between futures, options and contract months. Q Formulas - ability to define specific market spreads to quickly analyze price relationships between various markets. For more information about CQG Trader, please contact your broker or Electronic Trading Solutions Representative at ETS@STRAITSFINANCIAL.com or give us a call at +1.312.670.2822.